TERA’s Fate of Arun expansion raised the level cap from 60 to 65. Along with this level cap change, many of its systems such as the Masterworking process, Gear Tier, and Gear Progressions has been revamped and changed. This guide will help you from level 60 to endgame gear and character progression. This guide will cover what tier gear to aim for, where they are found, and what will be the next step to aim for. 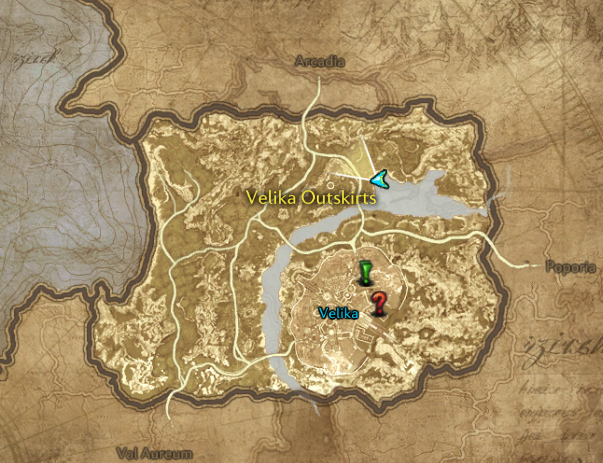 This guide is current for up to the Velik’s Fate patch. Returning to TERA, or just hit 60? 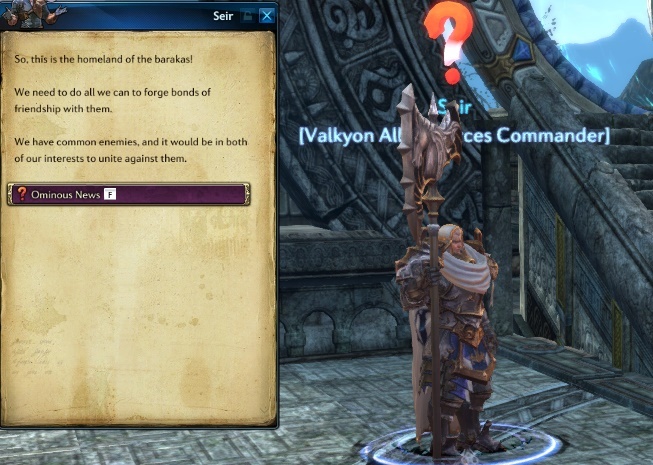 You’ll notice two things when hitting level 60 (or if you’re returning to TERA as a pre-Fate of Arun player). When you reach level 60, you will be given Airship Platform Teleport Scroll, placed into your inventory. This teleportal scroll will send you to the starting area for Fate of Arun quests (Velika Outskirts). The second thing is the Vanguard Request’s board, you can access this by pressing “H” (Default) or by clicking the Vanguard icon under your mini map. This will essentially guide you through the “Story Quests and Objectives” till 65. You’ll start automatically receiving Daily Quests: these are your “General” quests, there are also “Dungeon” and “Battleground” quests as well. Completing these quests will give you experience, gold, feedstock, and a new reputation credit called Vanguard Initiative credits, which can be used to purchase essential items, such as Crystals, Masterwork Alkahest and Glyphs. However, there is a limit on how many you can do a day, and you’ll get no rewards after you reach the limit. 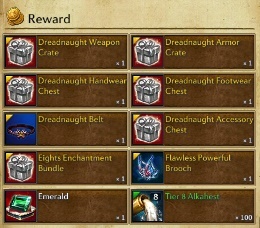 Be sure to turn in and claim your reward after you finish each Vanguard quest (press H and click “Claim Reward”). If you feel like you’re ready, then proceed by using the Airship Platform Teleport Scroll which will take you to Velika Outskirts. Talking to the NPCs, you’ll receive the Fate of Arun Story Quests. They are fairly easy to follow and always remember that if you are stuck then press “H” to see what part of the story you are on. Clicking “Check Quests” will open your “Quest’s Log” and display what quest you are on and what you are required to do (like normal questing). If your gear is outdated, don’t worry since you’ll be given new gear from the main story quests to aid you. You’ll receive the Initia armor and accessories from the first set of story quests. This is an enchantable set, and I recommend enchanting it to +9. Another alternate is doing Manaya’s Core for the Level 60 gear set. You’ll receive the Emina armor and accessories from quests around level 62. This is an enchantable set, and I recommend enchanting it to +9. This gear will be sufficient until level 65. For your weapon you’ll start receiving Avatar Relic Pieces as you kill monsters (you also obtain some from story quests). Don’t worry about hunting these pieces, as you’ll get them eventually by just killing monsters for the quests. You’ll receive Ishara’s avatar weapon (level 60) when you collect 8 Ishara’s Relic Pieces, these are obtained by killing monsters in Velika Outskirts and the new zones when you’re level 60. I recommend enchanting to +9. You’ll receive Oriyn’s avatar weapon (level 62) when you collect 15 Oriyn’s Relic Piece, these are obtained by killing monsters in the new zones when you’re near level 62. I recommend enchanting to +9. You’ll receive Bahaar avatar weapon (level 64) when you collect 10 Bahaar’s Relics, these are obtained by killing monsters in Macellarius Catacombs, Velika Outskirts and the new zones when you’re level 63. I recommend enchanting to +9. Do not dismantle this weapon when you reach level 65, as it is going to be your first endgame weapon. Questing is a good way to level to 65, as the amount of gold you earn from quest rewards will help you get started with your endgame gear. However, there are other ways to level such as repeating dungeons, battlegrounds or even simply mob grinding. If you feel like you want to grind your way to 65, then you kill BAMs or concentrated areas of monsters on your vanguard, such as the area outside Amadjuak Trading Post. Both of these yield a decent amount of experience and drop Khirian Glyph Crates and Vanguard Glyph Crates that give important Master Glyphs for your skills. Master Glyphs are better versions of normal white glyphs, and they reduce the glyph cost or give a stronger effect. The Khirian Glyph Crate will give a random uncommon master glyph for your class. The Vanguard Glyph Crate gives a random improved glyph for your class. You can also purchase Glyph with Glyph Tokens from the Vanguard Reputation Merchant. I recommend repeating both dungeons until you have attained all important glyphs. Original work by Zephya (general layout, presentation, “Getting Started”, “Gearing 60-65”, “60+ Dungeons, Glyphs and Skills” and “Fate of Arun” patch progression). Updated for “Go Berserk!” progression by Floss. Updated for “Secrets and Shadows” progression by Banim and Floss. Updated for “Spellbound” progression by Obsie. Updated for “Honorbound” progression by Floss. Updated for “Velik’s Fate” progression by Floss. So, if I am one of those returning players, is the flat attack bonus and +2 power on Misery really worth replacing my Imperator (VM7) weapon/gloves for? Misery is maybe about equal to Imperator (VM7) so you may be able to farm VM9 with +15 Imperator gear, as long as you don’t have a problem finding parties to run dungeons with. I followed the guide and enchanted the slaughter set but my item level is 409 and not meets the required 410. What did i miss? Did you roll your gear properly? Yellow rolls increase ilevel. Thank you very much, I didn’t know that. If you had +15 starfall from before, it would have been equivalent to guile but Guile is definitely better than +12 Starfall. I would advise getting the full +12 Guile set if you plan on actively playing for the next month . However I do not recommend progressing any further this patch. I would spend the rest of the patch farming IoD and building gold/feedstock/alkahest supply for next patch. So if i understand corretcly – if im not super hyper active NOW you suggest me to stick with my +12 starfall untill next patch ? Im rly copnfused and not up to date now…any quick hint whats gonna happen next patch? Sorry I meant island of dawn. When you press H, your vanguard window will open. Look for green vanguard quests that say to kill 10 bams. There are low, mid and high tier bams. I would suggest doing the mid-tier bam quest and if you manage to get enough ilvl, the high-rise bam quest as well. Completing the bam quest will reward you tokens (among other things). I would suggest using the tokens to buy caprin horns and selling them. Now, the reason why I suggested stopping after Guile was because in about 1-2 weeks, there will be a new patch releasing a new class. I would suggest trying that class to see if you like it. It will be a very strong class. And we predict about 1-1.5 months after that patch, we can expect another patch with all new gear. I had some old avatars where i logged in in february this month 2017 and there were the island of dawn quests in my quests, thats good. But i just leveled up a 65 character this month and i did not receive any of the story/optional quest of Island of Dawn. Did they actually remove the quests? Did i miss a step? Or are all new leveled 65 characters not getting the quest anymore? I believe that you get the IoD quest after a certain item level with a recent update. You might need to do Echoes of Aranea/Raider’s Challenge in order to get a few pieces of Slaughter before getting the IoD quest. I can’t confirm that for myself though. Seir should be in the northern part of Highwatch if you have the appropriate quests. hi thanks for responding.yes, you are right. I needed the echoes of aranea step before IOD. thanks so much! Is it worth Re-Rolling Low-Tier Jewelry and Brooch? It’s usually better to just save Semis for BiS jewelry. You can “reroll” low tier jewelry and brooches by just getting new ones. You can just skip Slaughter (Lucid +15 is about the same as Slaughter) and start working on Guile. The hard part will be getting the materials for enchanting rather than getting the gear itself. Hi, just a little comment on the Guile equipment. I don’t know where you go the screenshots with the stats like that, but as of now they’re incorrect. All the armour pieces are shown to give 8 power (even the belt) in the guide, while they only give 7 in-game, making Imperator gear more powerful (since those do give the 8 power shown here). Just an FYI. Also a question, is it worth making the gloves and boots for Imperator +15? When I made the page, I assumed that the Power/Endurance of the gear increased by 1 like it has in the previous patches. I’ve fixed it since. Making any Armor +15 for DPS is a Luxury in my opinion. It depends on the resources you have. Also is Slaughter easier to plus now? or still just as hard as it was back when it just came out? Im a priest and both Pve and Pvp and not sure of what gear is good from going from +12 dread pants and gloves and +15 starfall weapon and torso? Slaughter is easier to enchant and masterwork as it is now the low-tier gear of the patch. If you have Starfall +15, you can just skip Guile. The Dreadnaught pieces should be upgraded to Slaughter (if you don’t have much gold) and eventually Guile or better. Starfall +15 is about equal to Guile (mid-tier), with some pieces being better and some pieces being worse depending on the class and piece. so can i jump to slaughter or dread ? or i have to go up a bit by bit like this guide said ? Can It help in lvl 65 dungeons ? Or I have to progress through the sets as in your post ? You should just be progressing through the sets in this post. Devastator is extremely outdated as you might have expected. When you say “It may be predicted that each Imperator piece may cost 1 million gold or more. Goodluck!” you mean a piece of equipment +15 w/ right stats rolls? Yes, awakened enchanting is a very expensive process. Each try of T10 on a weapon costs over 20k gold and you should expect over 50 tries. Many people have had over 100 tries without even +15 to show. What is “loD” and can you also tell me the quest name. Much appreciated. Additionally, completing the two Island of Dawn Story quests, “Ominous News” and “Desolate Garden”, rewards a full set plus some more consumables to help you with enchanting. where is the “Vanguard Reputation Merchant” mentioned in this post? I can’t find them. The merchants can be found in Highwatch near the main Tradebroker and banker NPCs. Is there an information about which stat items to wear for each class? I have brawler and gunner but not sure which one should wear which stats. What do you mean stat items? Is this updated for the brawler patch? Yes, it’s updated for the Knockout patch. However, it doesn’t include Lucid and Tensus, which might be a viable option for certain classes. Yes, this is current for the brawler patch but I will update it today to include the storyline quest and Lucid/Tensus. Ah yeah…thanks much clearer now. Thank you! So I have a question. I have full Idoneal, I have all my glyphs and my Item Level is now 346. But with the new patch the ilvl required to enter Kalivan’s Challenge and Channelworks is 355??? How am I supposed to get the next level of gear if I can’t get into the dungeon to get it? I guess I should change the order. It’s important to get jewelry upgrades from Bathysmal Rise and make sure you have an innerwear (at least the quest one, if not better).